It seems that the technology trap - believing new stuff can fix old problems - afflicts corporate, nonprofits and individuals alike. Last week's Blogwalk 4 discussed introducing blogs and similar collaborative tools to companies, and an old diagram I showed seemed to resonate, and I said I would put it online for those interested. 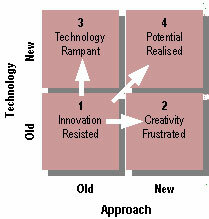 The point of it is that you need to deal with cultural change as well as technology change at the same time. If you try and bring technology in without commitment from the top, regard to working practices and so on, you'll get resistance... or lots of systems that don't work. And if you try and innovate without using appropriate tools you could be frustrated in your purpose. The diagram was originally developed with colleagues to help contain the enthusiasms a few years ago of nonprofits for the latest technologies, or (more often) to suggest they did have some value. You can find the full explanation here. I'm not claiming this offers any great new insight, but it's always interesting when something developed in one situation fits another... or perhaps something deliberately made simple for unsophisticated users has value more generally. Keep it simple, as they say. In discussion about the barriers to introducing blogs and similar tools, there was some amazement that senior management could possible fail to see the benefit of such powerful collaborative tools. My feeling was that these managers weren't so dumb, and could spot something that potentially challenged their control a mile off, even if they didn't quite understand how it work. As Lee Bryant at Headshift notes the Guardian newsblog picked up a an excellent piece by blogwalker Suw Charman on corporate blogging skills. Suw deals in more depth with some of the barriers to getting blogging accepted, and these skills into play. I was listening to an interview with Svali on YouTube regarding the illuminati and a caller named Dave Wilcox asked a couple questions. I was wondering if you were that same Dave Wilcox and if so, can you please contact me at fdi.mattwilcox@yahoo.com because I feel we might be connected.